If you’re situated at the top end of Australia where sweating is the everyday norm, and are considering becoming a backyard chicken keeper, then there are certain chicken breeds that will fare better than others in your climate. Chickens are a creature that prefer the cold to the hot, so it’s important for any keeper living in the warm weather to carefully consider which of the chicken breeds is best for their climate. Otherwise they may have some overheating hens on their hands! What constitutes a ‘hot climate’? Any temperatures that regularly rise above 32 degrees celcius - that level is where your chickens will feel a bit hot under the feather - so if you’re in the tropics or a location where it may get a bit steamy from time to time, these chicken breeds are most likely the best option for your backyard. What features do these chickens have that help them with warm weather? Warm weather suits chicken breeds that don’t have heavy feathering - some poor fowls are covered from their head to their feathered feet, and might get a little too fried in the hotter climates. After all - chickens’ feathers basically act as a warm blanket over their entire body, so heat can be an uncomfortable experience! Also, its best to opt for the bantam chicken breeds (that don’t have feathered feet) - the smaller the bird, the less heat they will generate, the better they’ll cope with warm weather. Chicken breeds that are the most suited to warm climates (according to Keeping Chickens, 1st Edition). The Leghorn is a splendid, strong bird that is renown for being one of the best chicken breeds for heat hardiness. They have successfully been raised in quite hot temperatures, and are a multi-purpose breed great for egg production or as a meat bird. The young hens start laying quite early - so you can expect fresh eggs fast (extra large ones to boot)! Also, they are intelligent and active birds that require a decent amount of space to roam around in order to live happy, healthy lives. The Rhode Island Red is a beautiful, rich coloured bird that not only is great for climates on the warmer side, but is one of the best egg-layers in the business! They are one of the most productive egg-laying chicken breeds, and you can expect 250-300 glorious shells of deliciousness to grace your kitchen table each year. They are a great bird for beginners, or those who simply can’t make up their minds - as they are a great all-rounder in temperament, eggs and climate hardiness aspects. The Fayoumi is one of the heat-hardy chicken breeds more suited to those living on acreage, or more experienced chicken keepers. They definitely thrive in warm climates, but can be a bit flighty and do require more room than average chicken breeds. It has a unique, upright appearance, and require a large amount of space to roam with high fences (they are unfortunately good fliers!). They do lay eggs, around 2 p/week, but their primary use is as an exhibition bird. The Fayoumi is one of those great chicken breeds that function well independently - they’ll forage to their hearts content, they are alert and conscious of their surroundings, and good at keeping themselves away from any potential predators! This breed is derived from the aforementioned Rhode Island Red - so it’s no surprise that they are a heat hardy breed. The New Hampshire Red suits backyard flocks as they are happy to forage around smaller spaces. They are one of the chicken breeds bred for a dual purpose - they are fair egg-layers (around 3 eggs p/week) but have more meat than the Rhode Island Red. They’re fast developers, so if you purchase young chicks, you might be surprised how quickly they reach their full size! The Brahma is a sweet, quiet bird that has a beautifully profuse coat of feathers and equally lovely temperament! They love a good cuddle, and don’t need a huge amount of space to roam in, so are perfect for backyard chicken keepers and families. You can expect around 3 eggs p/week, or they can be used as a meat bird as they are a relatively heavy breed. Opt for the bantam chicken breeds so your flock fares better in the heat. 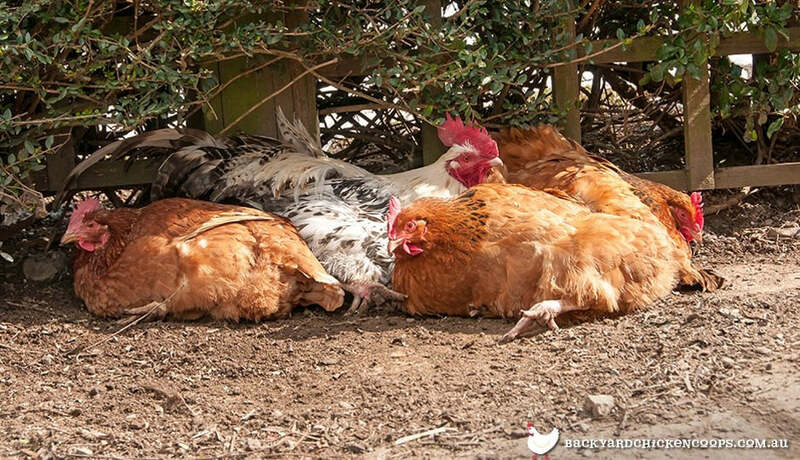 ensuring your hens have access to fresh, clean water is absolutely essential to their wellbeing - and to them staying cool, calm and collected! If they are looking a little toasty, you can even lightly sprinkle them with fresh water, to give them a little relief from the high temperatures. you can purchase some electrolytes to add to the chickens water trough if they are starting to look droopy and sluggish. 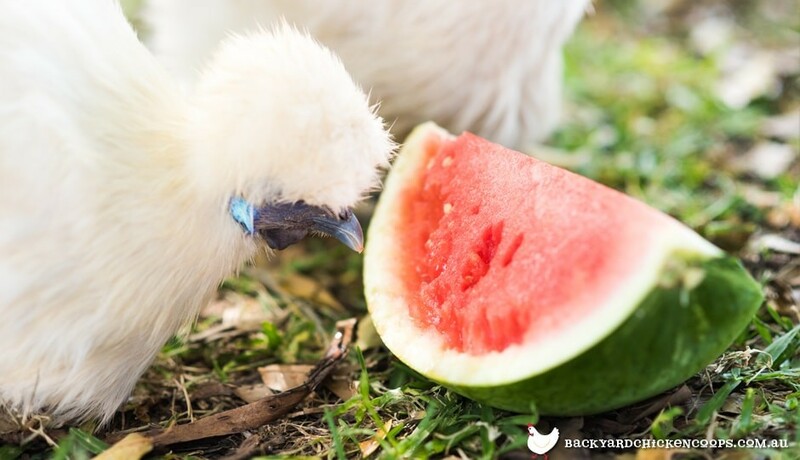 freeze some sweet treats like watermelon for them to peck at! They’ll love the refreshing taste, and the cool temperature. There are chicken breeds that can flourish in warmer temperatures, all it takes on your part is pre-planning about which type of chicken will suit your lifestyle and climate the best. One of the most successful ways to keep your hens healthy and cool is by ensuring they have a well ventilated coop to live in. A good coop must block all drafts and be well ventilated - so your chicks stay cool in summer, and warm in winter. Our entire Backyard Chicken Coops range is designed specifically for optimum ventilation, so your flock can nest in comfort!